With famous ambassadors and celebrities that have been spotted wearing it, the TAG Heuer brand is probably one of the most well known in the world. They offer high end watches and great customer service and support so there is no wonder why the brand has come so far. However, the brand is much older than we like to think, with more than 150 years of experience in watchmaking, so there’s no surprise why their watches are so loved and well made. 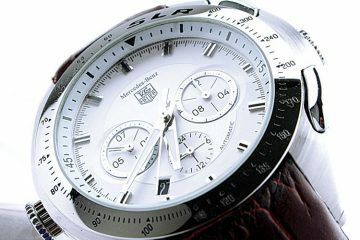 Whether you are a horological aficionado or just a person who wants a good watch, TAG Heuer is probably the right pick for you. Also, it has all kinds of watch models perfect for those who want something elegant as well as those who go for sport or casual. Besides their watches being good looking behind TAG Heuer lies an abundant history of new technology in watchmaking, which led them to create some of the most precise watches. 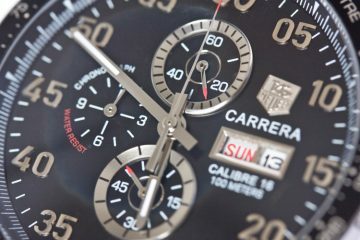 The TAG Heuer Caliber is one of those as it comes with a well-built automatic chronograph and is known to be the world’s first chronograph that measures and displays time to 1/10th of a second. So this amazing watch in both design and technology is a great accessory to wear if you want to achieve a certain social status. Also, let’s not forget that the watch is homage to car engine design and this can be seen on its hands and dial. However, don’t be fooled by the sporty elements, the watch can be a perfect choice for someone who wants something timeless and classy as well, because it incorporates all those elements in a beautiful timepiece. Obviously those who cannot afford one of the original watches would go for a replica but you have to make sure that you get the right replica and not just a cheap fake that is often sold. 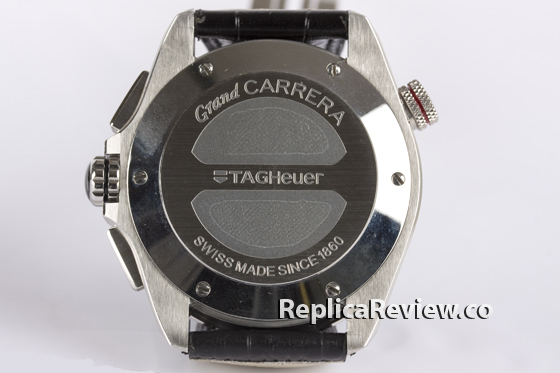 Here we have a replica of the TAG Heuer Caliber 36 and starting with the back of the watch to the sides we will analyze what makes the replica such a good pick. 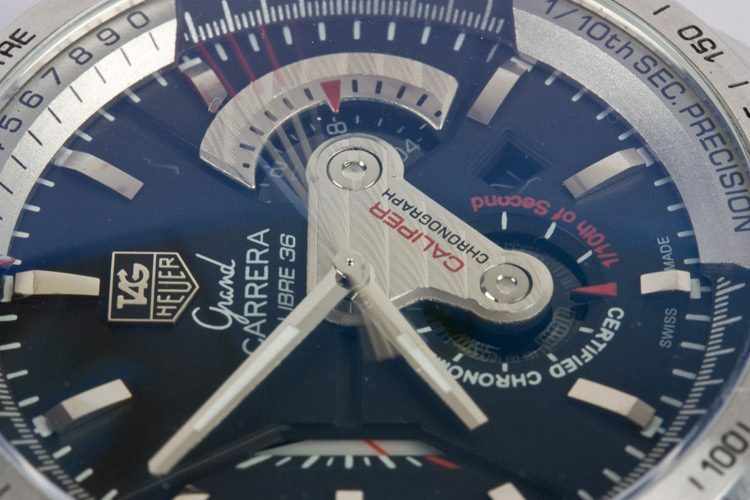 On the back we have the markings that can also be found on the original, with the same style and font the writings: Grand Carrera, TAG Heuer and Swiss made since 1860 give you the feel that the watch is genuine. On the front, we have the beautiful dial with the Grand Carrera elements that mimic the ones on the original to perfection. 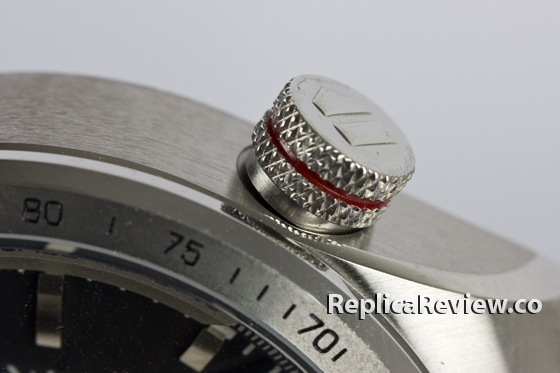 The sub dials are also very accurate and are also positioned where they should be positioned, just like on the original watch. On the inside of the bezel we can easily see the markings that give the watch yet again a genuine feel. 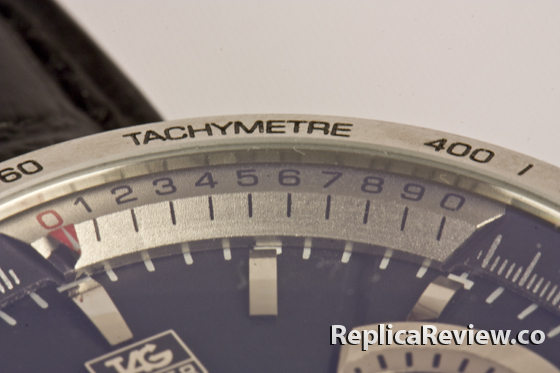 Also, the tachymeter is accurate with the same markings as the original watch. 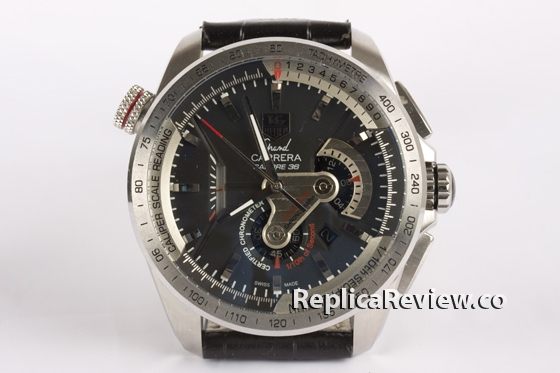 There is also the middle part of the dial that looks like a dashboard; that part has the writing Carrera Chronograph which is an element often overlooked when it comes to TAG Heuer replicas. The last but not least element that gives this watch its genuine feel is the crown, which definitely looks like the original to the smallest detail. P.S. 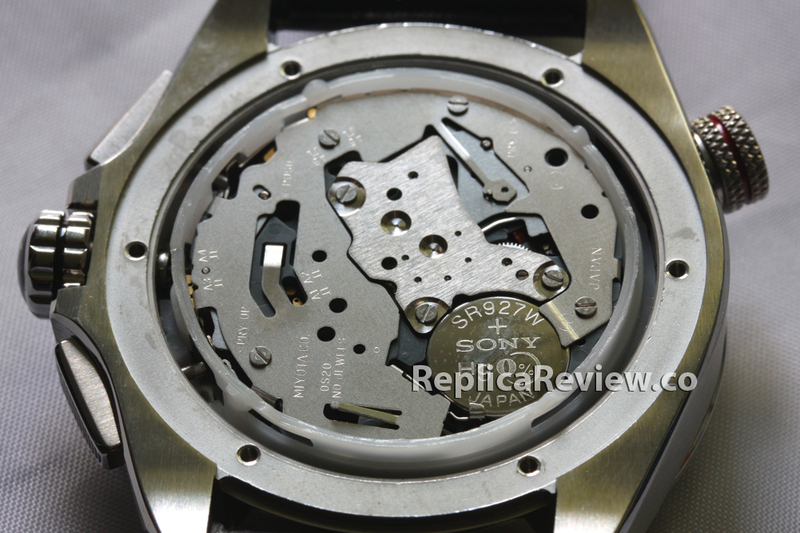 As per James request I post the image of watch mechanism. It’s quartz Miyota OS20 movement. 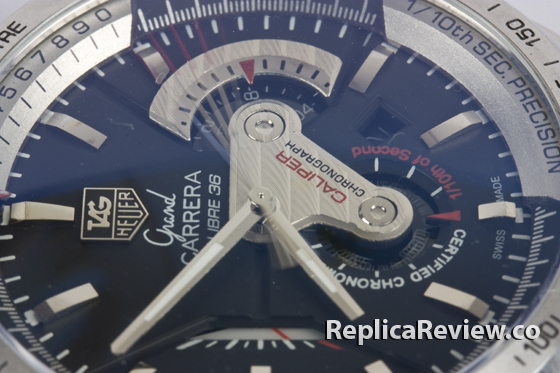 Hi, Good review but what movement is in this watch and the calibre 17 also reviewed? I will post images of this watch movement in a few days! Great review. I have a few questions. Is this website trustworthy and what do you thing about the price? 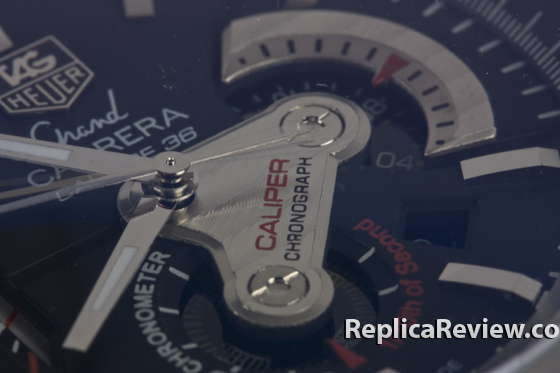 Where did you buy the reviewed watch, does it have sapphire or mineral glass? I’ve got this watch here. Yes, it has sapphire crystal. Unfortunately the model you reviewed is no longer available on their website. They only have the black version with the same quartz movement and the Swiss versions are much more expensive. I am still thinking of buying from replicahk.com. Isn’t the price a little bit too low for an automatic SWISS movement? What about the case material. Most watches are made from 440 stainless steel which is magnetical (not good for watches) but the replicahk version is made from 316L stainless steel which isn’t magnetical and is used by Omega, Breitling… It’s a little too good to be true :). On the pictures it looks fantastic. Do you have any experience with Western Union payment method? Is it trusthworthy? I pay by western union to stores I’m familiar with (second or third order). For a first order I always pay with credit card. If they try to rip me off I just dispute the payment. I can recommend this store. I know its been a few years now but I’ve had one of these for around 4-5 years except that mine is automatic(so I believe is a swiss replica then) and it has a metallic strap (not sure if stainless steel).